As a mutual insurer and friendly society, Foresters has built a reputation not only as a fair and egalitarian insurer, but also as a member-based benefits group that offers more than just financial protection. When you join with Foresters, you have access to Forester’s community support programs and scholarship services, making it a plan that can help shape your family’s future. Foresters Term Life 10, 20, and 30 year terms Ages 18 to 75 Guaranteed rates for term chosen. Renewable and convertible without medical exam to age 71. Foresters E-Z Term 10 years Ages 18 to 65 Renewable up to age 75. No medical exam required to qualify. PlanRight Whole Life For Life Ages 50 to 85 Coverage up to $35,000 with no medical exam. Available as a deferred plan. Participating Whole Life For life, with 20 year pay option Ages 0 to 85 Dividend accumulation lets you pay down cost of insurance or increase coverage. Cash surrender option available. No medical exam needed in some cases. SMART UL For life Ages 0 to 85 Guaranteed 3% annual growth on dividends. Policy loans available. Invest your premiums how you wish. 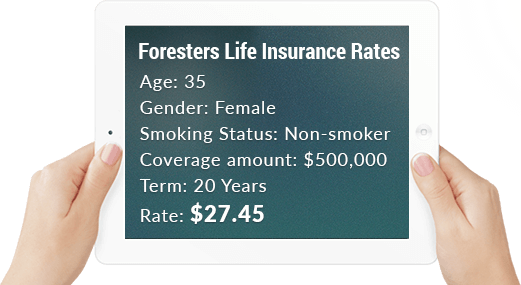 We are pleased to offer all life insurance products provided by Foresters. For a quote on all available life insurance plans, please use our no-obligation quote provided on the right to explore your options and find the right fit for your needs.